For a long time, I’ve been privately griping about the fact that Rock Band is still unavailable for the Wii. I don’t own an Xbox 360 or a PS3, and the only PS2 we have in the house is hooked up in my stepson’s bedroom (when he’s here – when he’s over at his father’s, he drags his PS2 with him). Therefore, as of yet, we’ve still not been able to get Rock Band. That’s one of the few games I’ve really wanted since its inception, especially after I found out how much the whole family enjoys playing it. 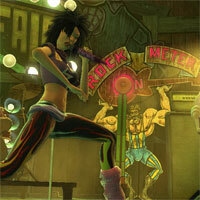 Now, within three months, there have been three separate press releases involving Rock Band for the Wii. On March 24, 2008, Harmonix made the official announcement that a “special edition” of Rock Band will be released for the Wii on June 22, 2008 (my sixth wedding anniversary). Then, on May 3, 2008, Harmonix announced on the Rock Band Web site that they would release a 20-track “add-on” pack for the Wii (and PS2) on July 15, featuring such great songs as We Care A Lot by Faith No More and Buddy Holly by Weezer (unfortunately, the entire Web site is built as a single Flash application, so I can’t link directly to the news story – also, if you are going to visit rockband.com, be warned that it will resize your browser without asking you) . Last week, Activision, the company behind Guitar Hero, announced last week that they will be releasing a new game called Guitar Hero: World Tour (GHWT) some time this fall. GHWT will feature not only the guitar with which we’ve all become so familiar. The game will also utilize a microphone for vocal tracks and a special drumkit for laying down the beats. The game will be available for the 360, the PS2, the PS3 and the Wii.